In the past, our blogs have generally focused on how we, as caregivers, can help the elderly, vulnerable and those in need. However, we very rarely blog about taking care of ourselves, which is an integral part of being an effective caregiver. In fact, one may argue that if you don’t know how to take care of yourself and relax, how can you help other people? The short answer is that you really can’t. Since April is National Stress Awareness month, we decided to do a 2-part series regarding stress. Last week, in Part 1, we discussed stress as it relates to our elderly loved ones and covered in-depth what to look for and how to help reduce elderly stress. 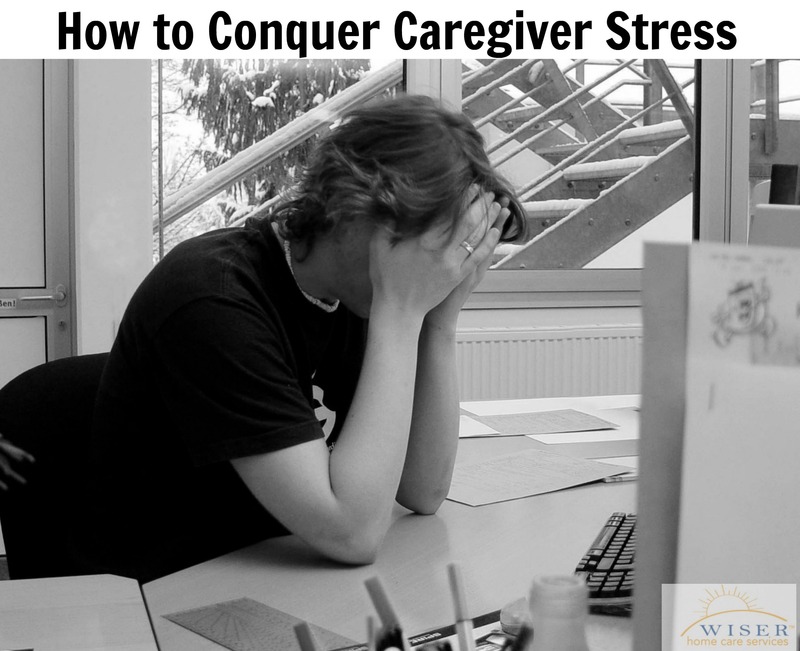 This week as we wrap up our series we will be looking at the effects of Caregiver stress and how to reduce its effects. Although caring for an elderly loved one can be rewarding, it is also demanding, and can be physically and emotionally draining. Caregiver stress can come from a variety of things including: home life, changes in the family dynamic, the increased workload and financial pressure. According to statistics, more than 65 million Americans provide care for a friend or loved one. On top of normal responsibilities and jobs, this care consumes on average an additional 20 hours per week. As you can imagine, this added responsibility puts a strain on finances. In fact, family caregivers are 2.5 times more likely to live in poverty and 5 times more likely to receive supplemental security income. However, worst of all, is caregiver stress and its side effects. The Center for Disease Control reports that over 35% of caregivers find it difficult to find time for themselves and 29% of caregivers have trouble balancing physical and emotional stress. In addition, the prolonged stress of caregiving has caused nearly 23% of caregivers to report poor health for at least 5 years after taking care of a loved one. Finally, 53% of caregivers who experience caregiver stress report noticing a decline in the quality of their care for their loved one. As unfortunate as caregiver stress is, the silver lining is that there are several great things you can do to help relieve your stress and burnout. We have gathered some of our favorite ways, but the options are infinite. The key is to find something you love outside of caregiving and set aside time on a weekly basis to do it. Get out of the house- Often when caring for a loved one, it is difficult to leave their house. Just getting out by yourself will be a big help. Have daily personal time- Experts recommend setting aside at least 30 minutes each day to focus on yourself and no one else. Laugh- Caring for a loved one can be demoralizing. Watch a comedy, read a funny book or go to a local improv show. Laughing will help raise your spirits. Visit with Friends- Make time to meet up with friends and have a good time. Sometimes it is helpful to have someone on the outside to talk and vent your frustrations to. Find the good- A lot of times it can be easy to get tunnel vision and think about all the negative aspects of caring for your loved one. Finding the good will help reduce your resentment and give you purpose. Focus on things you can control- A lot of stress comes from things that are beyond our control as caregivers. Focusing on what we can control can help fight off unnecessary stress. Remember that it’s ok to care for yourself!! If you still find yourself having a difficult time dealing with caregiver stress or finding time for yourself, we can help. Wiser Home Care Services offers Respite Care Services that provides support for family caregivers. At Wiser Home Care Services we know it is important to you to have great care for your loved one. We can help you do that. Our respite caregivers can be there overnight so you can sleep, or just a few hours so you can have some personal time or run errands. Setting up respite care is easy. Simply call or email us and we can setup an appointment to establish a care plan to personally accommodate your loved one’s needs and help you relieve your caregiver stress.